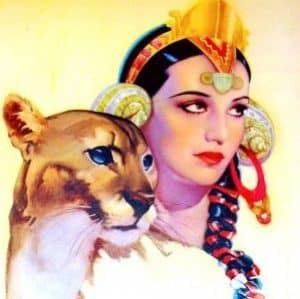 THIS IS A LEGEND told and retold among the people of Argentina about powerful friendship between a girl and the puma. Five hundred years ago when the Spanish entered South America, Native American tribes often fought back against the invaders. One way tribes could put pressure on the Spanish was to surround their settlements. This is what happened in the early 1500's when Maldonado, a Spanish girl, was 15 years old. Hostile Native Americans of the Querandí tribe had encircled the Spanish settlement where Maldonado lived. Before long, their food supplies were depleted. The people faced starvation. They begged their captain to allow them to take their chances and leave the settlement in search of food - but this the captain would not allow. Famished, Maldonado escaped the settlement and fled into the jungle. As night fell, she heard with alarm the calls of wild animals. Where could she safely sleep for the night? But there was one call that drew her closer. It was a cry of pain. She followed the sound to a cave where she found a puma that had just given birth. Maldonado helped the mother puma clean the cubs. Later, she watched the babies while the mother went out to hunt. And so days went by. One day, while Maldonado was gathering food and the mother puma was inside the cave with her cubs, the girl was surprised by Querandí warriors. They captured her and brought her to their village. Fearing the worst, Maldonado braced herself for the death she felt certain was to come. But the Querandís were kind to the girl. They taught her tasks to help in their village, and she gladly took part. One day, a band of Spaniards attacked the Querandí village. Recognizing a Spanish girl, they grabbed Maldonado and forced her to return home. The Spanish captain was furious that she had disobeyed him by escaping to the jungle. To make an example of her, he commanded that she be tied to a tree and left there for wild animals to devour. After several days, the sad villagers ventured where Maldonado had been tied to the tree, fearing the worst. Much to their surprise they found her still tied to the tree and very much alive. Much more surprised were they to learn that it was a mother puma who had fed and protected the girl all that time. Question 1: Tell about a time when you did something nice for someone else, and later they did something nice for you. Question 2: Tell about a time you did something nice for someone and they haven't done anything nice yet in return. Are you sorry (or are you okay with it) that you were nice in the first place? The story is a legend. History tells us that Maldonado's Spanish settlement was abandoned in 1540 and moved to modern-day Paraguay. Forty years later, the site was re-founded 40 years as Buenos Aires. It's also interesting to note there's a city in Uruguay (across the Río de la Plata, or in English, the Plata River) named Maldonado in honor of the heroine of this tale.